Our fresh homemade thick and creamy New England style clam chowder, prepared daily. Grilled Shelton chicken breast, avocado, hard cooked egg, cucumber, vine ripe tomato, bacon, and blue cheese crumbles. Served with your choice of dressing. 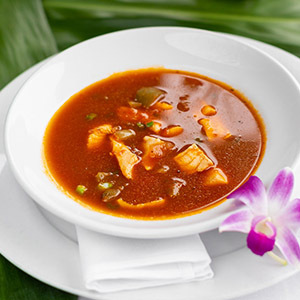 Spicy tomato based soup with fresh fish, served with cruets of dark rum and sherry pepper. Fresh Dungeness crab meat or shrimp served on mixed greens with baby iceberg lettuce, vine ripe tomato, avocado and hard cooked egg accompanied with our house made “Louie” dressing. Our Chef's own Caesar dressing with chopped romaine lettuce, finely shredded Parmesan cheese and homemade Hawaiian bread croutons. Ahi Tuna add 10, or Jadori Chicken add 8. 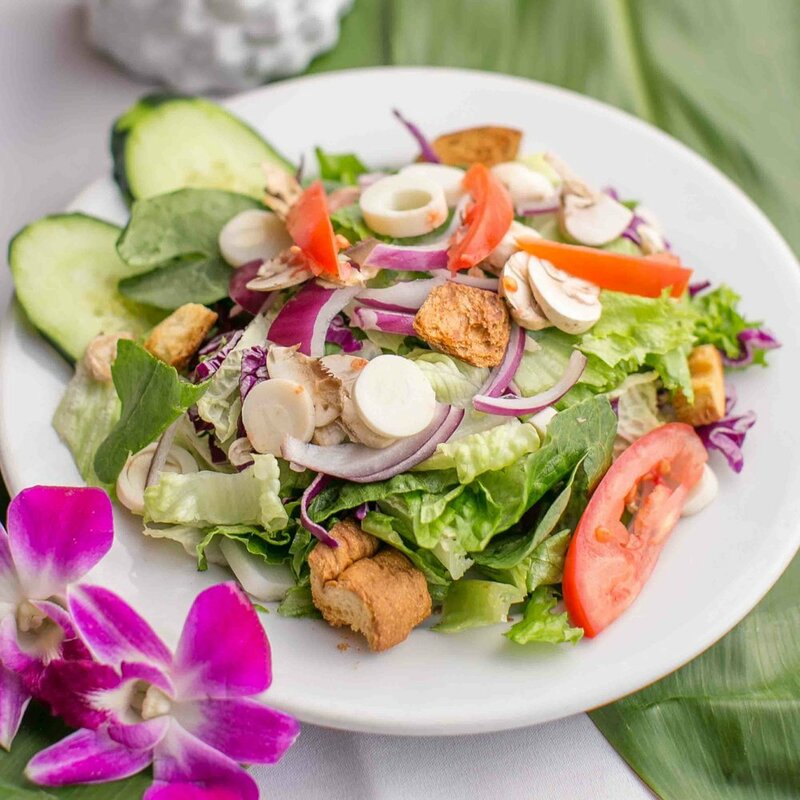 Mixed greens of romaine, iceberg and green leaf lettuce, Napa and red cabbage, fresh hearts of palm, Bermuda onion and mushroom. 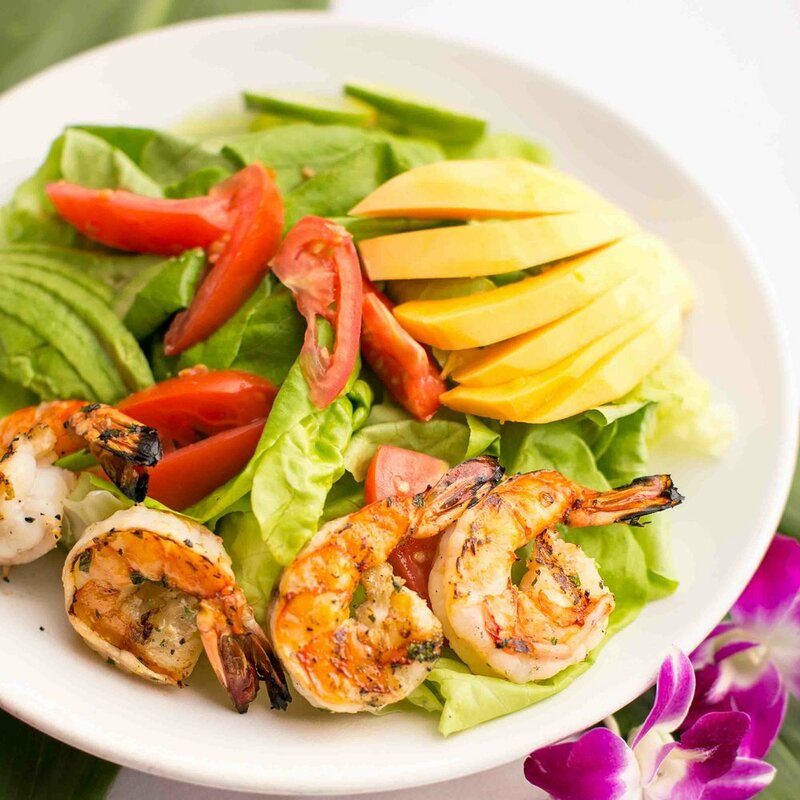 Grilled prawns, Hawaiian papaya, butter lettuce, tomato, avocado, and papaya seed dressing. A yellowfin tuna fillet seared rare on a sesame seed bun with caramelized onions and Dijon soy sauce. Served with Vietnamese hot sauce and French fries. Our family recipe albacore tuna salad piled high on King’s Hawaiian sweet bread (toasted or not). Served with French fries or coleslaw. Cheese available by request. A half pound of freshly ground beef grilled to order with your choice of cheddar, American or pepper jack cheese. Served with French fries or coleslaw. 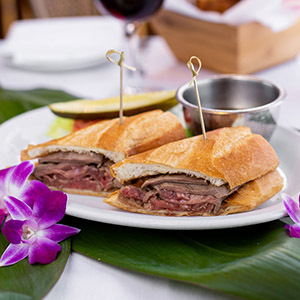 Tender baked prime rib, thinly sliced and served warm on a French baguette with au jus sauce and French fries. Freshly sliced turkey breast, apple wood smoked bacon, tomato, avocado, and mayonnaise on toasted Hawaiian sweet bread. Served with French fries or coleslaw. Zesty stir fry shrimp and chicken mixed with a fragrant ginger based sauce, cashews, and vegetables. Served over a bed of sticky white rice. We use tender Hawaiian Ono or large shrimp, lightly fried in a homemade Pacifico beer batter. Served with French fries and our homemade tartar sauce. A charbroiled New York strip steak served open faced on a slice of our famous Hawaiian cheese bread. Served with French fries or coleslaw. Grilled Shelton chicken breast with avocado, red onions, basil, lettuce, and tomato on a crisp baguette. Served with French fries or coleslaw. Two scoops of albacore tuna salad served open faced on a whole avocado. Pacifico beer battered Ono served with shaved lettuce, cilantro, cheddar cheese, guacamole and salsa. Our fish entrées are served with two sides of your choice; broccolini, bok choy, vegetable stir fry, sautéed spinach, jasmine or brown rice, coleslaw, or French fries. Asparagus is available at an extra charge. 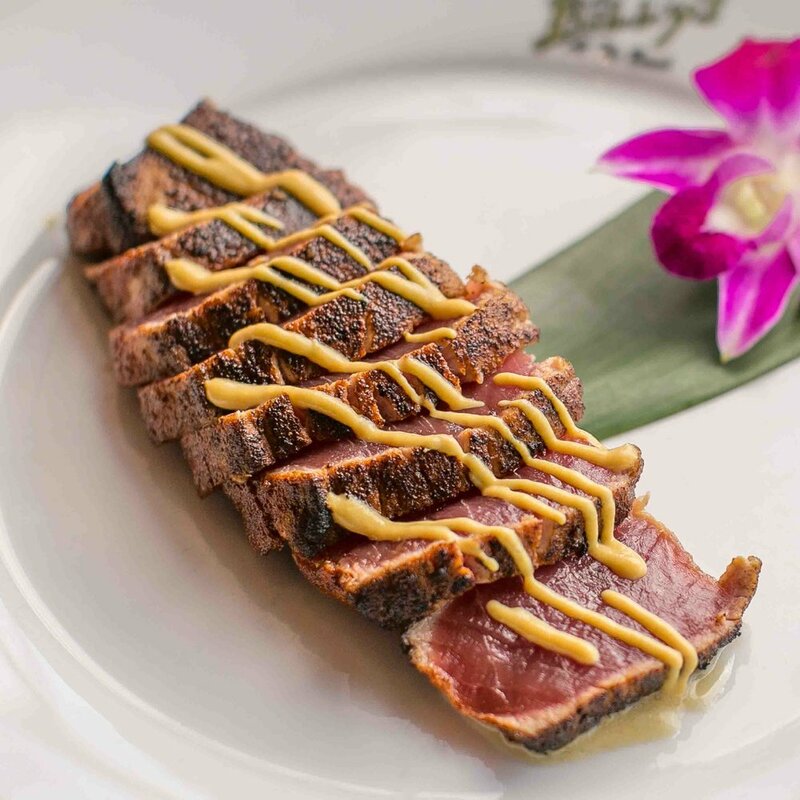 Hawaiian yellowfin ahi seared rare and blackened with Cajun seasoning laid on top of beurre blanc then finished with Dijon soy sauce. Fresh Atlantic Salmon crusted with coconut, macadamia nuts and panko. Pan sautéed and served with macadamia balsamic rum syrup and mango salsa. Sautéed or grilled with a mushroom and chardonnay reduction sauce, or blackened with a mango and papaya salsa. Crab crusted style $7 extra. Hand cut fillet charbroiled and served with Chef’s smoked lobster sauce. Pan seared halibut crusted with a macadamia nut and panko mix. Paired with white wine beurre blanc sauce and mango salsa. FOR THOSE WHO HAVE FOOD ALLERGIES OR DIETARY RESTRICTIONS-PLEASE INFORM YOUR SERVER. CONSUMING RAW OR UNDER COOKED MEATS, POULTRY AND SEAFOODS MAY INCREASE YOUR RISK OF FOOD BORNE ILLNESS.